Fernando Alonso has returned to training as he bids to race at the Chinese Grand Prix on 17 April. 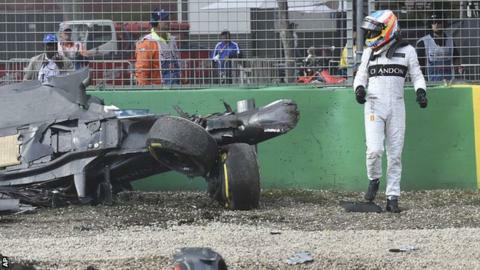 The Spaniard was declared "medically unfit" for the Bahrain Grand Prix following a crash in Australia, when he hit the back of Esteban Guterrez's Haas and came to rest upside down. "Return to the training," the McLaren driver, who suffered rib fractures and a collapsed lung, wrote on Instagram. "In the next few days, I hope to do also cycling and swim. Step by step." Alonso's participation in the Shanghai race, which begins with practice sessions on Friday, 15 April, will depend on him passing a FIA medical test. When asked if the 34-year-old was confident of being passed fit to race, McLaren racing director Eric Boullier said: "I think so. Obviously he is going to go through scans, and then the FIA will inspect them and decide 'yes or no'." Alonso watched the Bahrain Grand Prix from the sidelines, replaced by McLaren's reserve driver Stoffel Vandoorne. The 24-year-old Belgian finished ahead of team-mate Jenson Button in qualifying before scoring the team's first points of the campaign by placing 10th.